PUEBLO - The individual considered by many as the "Father of Cannabis Research will present the inaugural Mechoulam Lecture named in his honor as part of the 2017 Institute of Cannabis Research (ICR) Conference next April at Colorado State University-Pueblo." Dr. Raphael Mechoulam, an organic chemist and professor of Medicinal Chemistry at the Institute for Drug Research at Hebrew University of Jerusalem in Israel, will speak as part of the 2017 ICR conference, April 28-30. "It is truly an honor to have such a seminal figure speak at our Institute's inaugural conference," said CSU-Pueblo Provost Rick Kreminski. The Bulgarian born professor is a pioneer in the field of cannabis research and a discoverer of the endocannabinoid system. He is oft considered the most prominent figure in the world of cannabis research as his ground breaking discoveries in the 1960's -- isolating, determining the chemical structure of and synthesizing CBD and THC -- are the basis for nearly every piece of research conducted today. His main contributions are in the field of the constituents of cannabis and the endogenous cannabinoids found in the brain and in peripheral organs, such as kidneys, lungs, etc. He has published extensively on their pharmacological activities, and his research has been cited more than 40,000 times. His research interests are in the field of the chemistry and biological activity of natural products and medicinal agents. 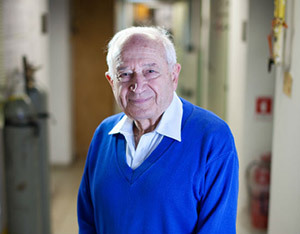 Mechoulam received his master's degree in biochemistry from the Hebrew University in 1952 and his Ph.D. from the Weizmann Institute. He completed his postdoctoral research at the Rockefeller Institute. Mechoulam has received many honors, including honorary doctorates in Spain and the United States, the Israel Prize in 2000, and the European College of Neuropsychopharmacology Lifetime Achievement Award in 2006. In 2012, he received the Rothschild Prize for attaining new horizons in understanding the chemistry of natural substances that influence human behavior. He has led the study of the chemical basis of the activity of cannabis, and in more recent years, in the elucidation of its physiological effects and potential for the development of new drugs. CSU-Pueblo President Lesley Di Mare said attracting such a key international figure to CSU-Pueblo validates the creation of the Institute by University leaders and points to the international interest it already is receiving. "I could not be prouder of how our hard work and willingness to move forward with the Institute already is paying dividends by attracting the attention of such a renowned researcher in Dr. Mechoulam, Di Mare said. "His appearance in association with our inaugural conference will bring global visibility and provide the impetus for the Institute's future success. In 1963, Mechoulam elucidated the structure of cannabidiol (CBD), one of the most medically relevant compounds found in cannabis. Shortly thereafter, he isolated and elucidated the structure of the active component of cannabis, tetrahydrocannabinol (THC) in 1964. Nearly three decades later, in 1992 and 1995, he isolated and identified the endogenous cannabinoids, anandamide and 2-AG, which together with specific receptors form the endocannabinoid system a major endogenous biochemical system found in the brain and peripheral organs that is involved in a wide range of physiological functions. All proposals will undergo a peer-reviewed selection process. Submissions may be made at www.csupueblo.edu/ICR/2017 by Nov. 15. Research agreements with Pueblo County and the State of Colorado in 2016 brought resources to help establish the ICR, the nation's first cannabis research center at a regional, comprehensive institution. Research topics range from neuroscience research on cannabinoid receptors to studies on industrial hemp. County-requested impact studies include power and water usage impacts, optimal buffer zones between approved sites growing low and high THC cannabis, as well as the social and economic impacts on the community. The University will host the first academically-based conference on cannabis April 28-30, 2017.